The crown of the First Mexican Empire was made for Emperor Agustín I in 1822, and it can be seen in many of his portraits. However, its history is not entirely known. Emperor Agustín I with the crown of the First Mexican Empire. Coronation of Emperor Agustín I in July 1822. Emperor Agustín I's crowned coat of arms. Empress consort Ana María with the Imperial Crown of Mexico. 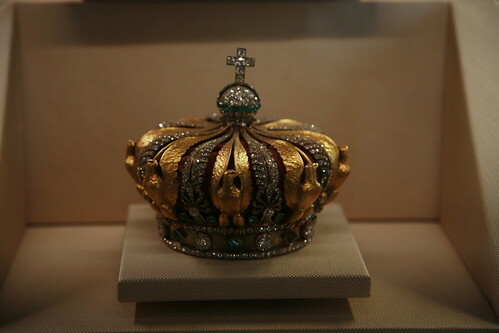 The second Imperial Crown of Mexico, created during the Second Mexican Empire for Emperor Maximilian I (his consort was Charlotte of Belgium, known as Empress Carlota), who reigned from 1864 to 1867, is better documented. The original crown was destroyed during the ensuing fighting and victory of the Mexican republic, but replicas remain on display. The Imperial Crown of Mexico during Maximilian's reign was modeled on the crowns of France and Austria. The crown of Maximilian's ancestor, Maximilian I, Holy Roman Emperor, had two arches which crossed over the top of the miter. It is this unique form which appears to have been the model. However, since Napoleon III was the main power behind the Second Mexican Empire, and as an extension of the Second French Empire, the Mexican crown also used the half-arches and eagles on the circlet on the front, back and sides from the crown of Napoleon III. The Imperial Crown of Mexico also shares many similarities with the Crown of Empress Eugenie, Napoleon III's consort. Emperor Maximilian I with the crown of the Second Mexican Empire. Replica of the Imperial Crown of Mexico. Statue of Benito Juárez made in 1894 at Paseo Juárez "El Llano" in the historic centre of Oaxaca. Juárez holds a Mexican flag with one hand and points with the other to the Imperial Crown of Mexico below, representing the defeat of the Second Mexican Empire. This Mexican history article is a stub. You can help Wikipedia by expanding it. Maximilian I was the only monarch of the Second Mexican Empire. He was a younger brother of the Austrian emperor Franz Joseph I. After a distinguished career in the Austrian Navy as its commander, he accepted an offer by Napoleon III of France to rule Mexico, conditional on a national plebiscite in his favour. France, together with Spain and the United Kingdom, invaded the Mexican Republic in the winter of 1861, ostensibly to collect debts; the Spanish and British both withdrew the following year after negotiating agreements with Mexico's republican government, while France sought to conquer the country. Seeking to legitimize French rule, Napoleon III invited Maximilian to establish a new pro-French Mexican monarchy. With the support of the French army and a group of conservative Mexican monarchists hostile to the liberal administration of the new Mexican president, Benito Juárez, Maximilian was offered the position of Emperor of Mexico, which he accepted on 10 April 1864. Carlota of Mexico was a Belgian princess who became Empress of Mexico by marriage to Emperor Maximilian I of Mexico. Agustín de Iturbide y Green was the grandson of Agustín de Iturbide, the first emperor of independent Mexico, and his consort Ana María Huarte. The Mexican Empire was a short-lived monarchy, and the first independent post-colonial imperial state in Mexico. It was the only former colony of the Spanish Empire to establish a monarchy after independence. Together with the Brazilian Empire and the two Haitian Empires, it was one of four European-style empires in the Americas; it lasted two years before transitioning into a federal republic. The Mexican Empire or Second Mexican Empire was the name of Mexico under a limited hereditary monarchy declared by the Assembly of Notables on July 10, 1863, during the Second French intervention in Mexico. It was created with the support of Napoleon III of France, who attempted to establish a monarchist ally in the Americas. A referendum confirmed Austrian Archduke Ferdinand Maximilian, of the House of Habsburg-Lorraine, as Emperor Maximilian I of Mexico. The Emperor of Mexico was the head of state and ruler of Mexico on two non-consecutive occasions in the 19th century. There were three Imperial Orders of the Mexican Empire, created to reward Heads of state and prominent people during the two periods of the Mexican Empire – the Imperial Order of Guadalupe, the Imperial Order of the Mexican Eagle, and the Imperial Order of Saint Charles. 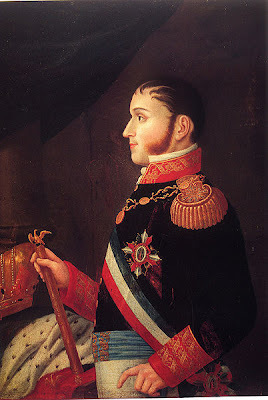 Salvador Agustín Francisco de Paula de Iturbide y Marzán was the grandson of Agustín de Iturbide, the first emperor of independent Mexico, and his consort Empress Ana María. He became the adopted son, along with his cousin Agustín de Iturbide y Green, of Mexico's only other royal heads of state—Emperor Maximilian I and Empress Carlota of Mexico. Salvador María de Iturbide y Huarte was the eighth child of Agustín I of Mexico and Empress Ana Maria Huarte. He was married in 1845 to Doña María del Rosario de Marzán y Guisasola. His descendants, through his son Salvador de Iturbide y de Marzán, are the current pretenders to the Mexican Throne. He was in the Secretary Mexican Legation in Washington, D.C. in 1849. María Josepha Sophia de Iturbide was the head of the Imperial House of Mexico from 1925 to 1949. A modest and very religious lady she played no political role whatsoever. She married twice and had two daughters. Agustín Jerónimo de Iturbide y Huarte was the eldest son of the first Emperor of Mexico, Agustín I of Mexico. He was the heir apparent to the First Mexican Empire and a member of the Imperial House of Iturbide. Later in life, he served as a military officer in South America and also worked as a diplomat for the United Mexican States at the Mexican embassy in the United States and in London, after his military career had ended in South America. The House of Iturbide is the former Imperial House of Mexico. It was founded by the Sovereign Mexican Constituent Congress on June 22 1822 when the newly-independent Mexican congress confirmed his title of Agustín I, Constitutional Emperor of Mexico. He was baptized with the names of Saints Cosmas and Damian at the cathedral there. The lastname Iturbide was originally from the Basque Country, Spain. Ana María Josefa Ramona Juana Nepomucena Marcelina Huarte y Muñiz was the first Empress of Mexico. She was the wife Emperor Agustín de Iturbide of Mexico. Her father was the provincial intendant Isidro Huarte and her mother was the noblewoman Manuela Muñiz y Sanchez de Tagle descendant of the Marquis of Altamira. The Prince Imperial of Mexico is the title created on June 22, 1822 by the Mexican Constituent Congress, to be granted to the firstborn and heir of Emperor Agustín de Iturbide. This title also refers to the heads of the Imperial House and designated to be the official title of the heir apparent to the imperial throne of Mexico. The Regency of the Mexican Empire was a period of transition in the history of the Mexican monarchy in the absence of the Emperor of Mexico and presided by a president of the same during the First Mexican Empire (1821-1823) and the Second Mexican Empire (1863-1867). The regency is the government of a State during the minor age, absence or incapacity of its legitimate prince. Josefa de Iturbide y Huarte was daughter of Agustín de Iturbide and Ana María Huarte who received the title of Mexican Princess during the First Mexican Empire by the Constituent Congress and Princess of Iturbide during the Second Mexican Empire by Maximilian of Hapsburg.